Are They Yams or Sweet Potatoes? What's the Difference Anyway? Ham Farms () has been farming since 1975. As one of the largest grower, packer, shippers of sweet potatoes in the United States, we maintain a year round supply of product for our customers all over the world. 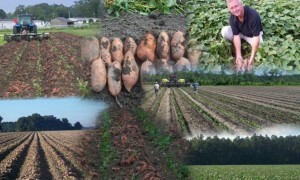 (we export to Canada and the UK) We grow over 8,000 acres of sweet potatoes in NC, FL, and Georgia. We have controlled atmosphere storage capacity for over 13 million bushels of sweet potatoes and other produce products. Overall, we grow 15,000 of total crops each year. Why do people get sweet potatoes & yams confused? What are the differences & the similarities? What is marketed in the United States as “yams” are really a variety of sweet potato, grown in the South. A true yam is a starchy edible root of the Dioscorea genus, and is generally imported to America from the Caribbean. It is rough and scaly and very low in beta carotene. “Yams,” as the industry and general public perceives them, are actually sweet potatoes with a vivid orange color and a soft moist consistency when cooked. They tend to have a sweeter flavor. Other varieties of sweet potatoes are lighter skinned and have a firmer, drier texture when cooked. Sweet potatoes are smooth with skins that can vary in color, depending on the variety, from pale yellow to deep purple to vivid orange. Flesh colors can range from light yellow to pink, red, purple or orange. So where did all of the confusion come from? Many years ago when orange flesh sweet potatoes were introduced into the southern United States, producers and shippers desired to distinguish them from the more traditional white flesh types. Many newcomers to America saw the sweet potatoes and referred to them as yams due to the similarities that were seen from between the sweet potatoes and their native “yam”. The African word “nyami” referring to the starchy, edible root of the Dioscorea genus of plants was adopted in its English form, “yam”. If you want to see if you can get this down right, you can take the sweet potato or yam quiz! Are they grown in similar geographies or different? 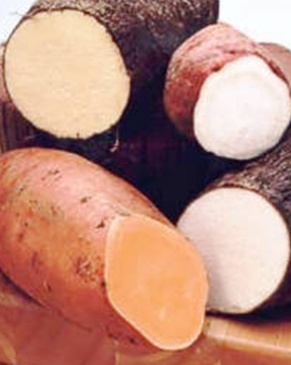 Sweet potatoes and yams are grown in different geographies. Yams grow in tropical climates, primarily in South America, Africa, and the Caribbean. Sweet potatoes potatoes can be grown where there is a long frost-free period with warm temperatures in the growing season. Most cultivars require a minimum frost-free period of 100-125 days, with a minimum average daily temperature of 77 degrees. Sweet potatoes also require almost an inch of water per week uniformly distributed throughout the growing season for highest yields. These conditions are primarily found in the southern US. Since sweet potatoes are grown in several southern states, what makes those areas similar? What kind of soils are best, the type of season that is best, etc.? Sweet potatoes are grown primarily in the southern US because the conditions of the climate and the lands geographical makeup are somewhat similar. Sweet potatoes are grown in sandy, loamy soils, and the season is dependent on the climate conditions mentioned above. In each of these regions, there is one growing season each year. Sweet potatoes are a storage crop, which means that they are grown, harvested, and stored throughout the year. March – October is the average growing cycle for a crop of sweet potatoes from start to finish. They are then stored to be packed for production until the next crop is harvested. 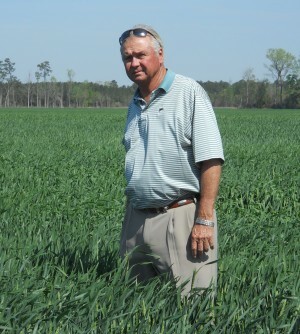 “Each year, our qualified staff soil sample every field during the winter months. This will allow us to make proper fertilization decisions for the upcoming crop. 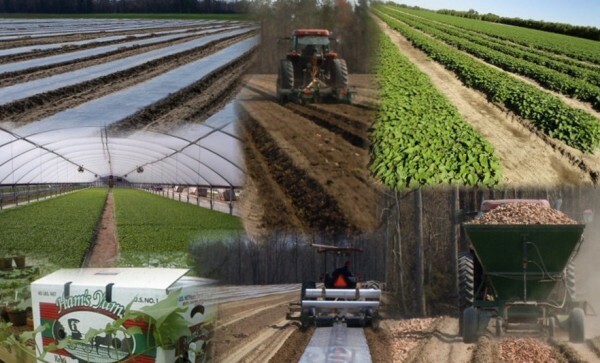 As a NC Certified Seed Producer, Ham Farms cultivates micropropgated, elite plants in our greenhouses. These plants are transplanted into our fields and roots harvested will become seed stock for the following year’s crop. Using certified seed will ensure a healthy, disease-free crop that is more uniform. In early March, our seed stock will be bedded in the field. These beds will produce our sprouts or slips for transplanting in May. Precision transplanters are used for planting, to ensure slips are spaced uniformly in rows. Transplanting will usually conclude before the end of June. Our staff will work diligently after transplant to ensure that fields are cultivated regularly in order to control the emergence of weeds. Sampling of fields and harvest planning will begin in July, as roots will have grown to a marketable size within 90 to 120 days. During harvest, field rows are turned up using a modified disk which uncovers the sweet potatoes. Roots are hand harvested and graded in the fields. The roots are then transferred into bulk containers and transported to one of our controlled atmosphere storage facilities for curing. What do you rotate sweet potatoes with? We rotate our sweet potatoes with several crops, mainly soybeans, wheat, cotton, cabbage, peppers, and other the vegetable crops that we grow. Do you guys plant other crops? Do most farmers? Ham Farms plants a variety of crops. As mentioned above, we grow wheat, beans, cotton, and cabbage. We also grow squash, onions, carrots, peppers, and watermelons. Farmers choose to plant the crops they plant for many different reasons. Most farmers plant multiple crops. Crop rotation is a major motivating factor. Many farmers will choose to specialize in growing a crop or a few specific crops, and will use other crops to aid in their crop rotation. For most crops you can see the crop mature, that doesn’t seem as easy with tubers, how do you know sweet potatoes are ready to be harvested? This is done by field testing. Provided that growing conditions and climate have cooperated; sweet potatoes are mature between 90-120 days. Once the crop hits 90 days, our farm managers will turn up hills as a sample to see what the condition of the crop is. Random sampling will give a good idea of each field’s makeup, size profile, and readiness for harvesting. Once they crop appears to be ready the harvest plan is put into action. Ham Farms grows over 8,000 acres of sweet potatoes. Strategy and planning play a very large role in the planting/harvesting process. What’s your favorite way to have sweet potatoes? Any recipe or cooking tips you want to offer? Personally, I like sweet potatoes cut up and grilled as fries. You can also check out a bunch of recipes on the North Carolina Sweet Potatoes website. I love how people pursue multiple paths these days! 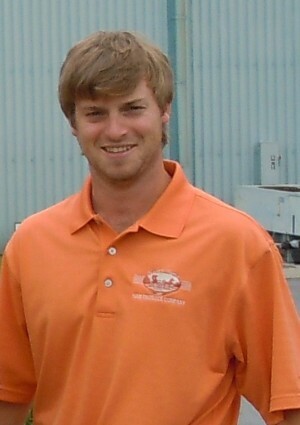 Will founded the AGrow Life as an agricultural marketing company aimed to connect AG professionals, and to educate consumers about the process that goes behind the products they purchase and consume. This website went live Monday, and will hopefully be a great resource for anyone who has an interest in the industry. Will has big goals for the company and hope to integrate several resources and tools into the mix that will be beneficial to both farmers, retailers, and consumers alike. He also has a Facebook page for The AGrow Life, AGrow_Life on Twitter and an Instagram feed so you can see photos. This Brings Us to Z! The Zed! I can’t believe it! 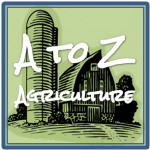 One more post to go and I’ll finish my A to Z on agriculture! So what will Z be for? Have you seen the other letters? You can see the other posts in this series by clicking on the logo at right and reviewing the letters, or by browsing the A to Z ag tag archives. Yes, we are in the final days of April so I’m chugging along on the alphabet train! Got ideas for me? « X is for Xylem — Plants have vascular systems? And with xylem in them? Thanks for featuring our product and operation! We are a big fan of your blog and enjoy reading the material that your are researching and writing about! Its good to see other people who are invested in Agriculture and the importance of the people involved! Thank you Will for the idea! I love sharing interesting pieces of agriculture and having a love for sweet potatoes, this was an easy decision to make! I love this post! I am Will’s twin sister Jenny, and have watched Will learn all about the sweet potato/yam/agriculture industry over the years. His knowledge and passion for the industry is very encouraging! Thanks for your post! Fun! Great seeing how much the enthusiasm he has gets passed around too! Thanks for coming to the site and you should know, I lived in NC a summer and have LOTS of family there. Love the state! This is awesome. I occasionally learned about/worked with sweet potato farmers in California, although they are nowhere near as common out there as they are in the south. I LOVE me some sweet potatoes. Thanks for what you do, Will! And thanks for sharing it with us, JP. You are welcome Kelly! Thanks for sharing the love of sweet potatoes on the blog! Awesome! Kudos to Will and other Sweet Potato farmers! My mom had a great sweet potato casserole recipe, one of the few I’m actually able to replicate, and it’s a hit at every potluck I take it to. You’ve made me wish I could make some of it right now. Love memories of mom foods! And like you it always makes me wish I had the food readily available!